Veendam offers Holland America's As You Wish dining program, which means passengers can opt for pre-set seating and dining times at dinner (at 5:45 p.m. and 8 p.m.) or choose the open-seating option and arrive at the dining room anytime from 5:15 p.m. to 9 p.m. Breakfast and lunch are always open-seating. Passengers must request either option during the booking phase. 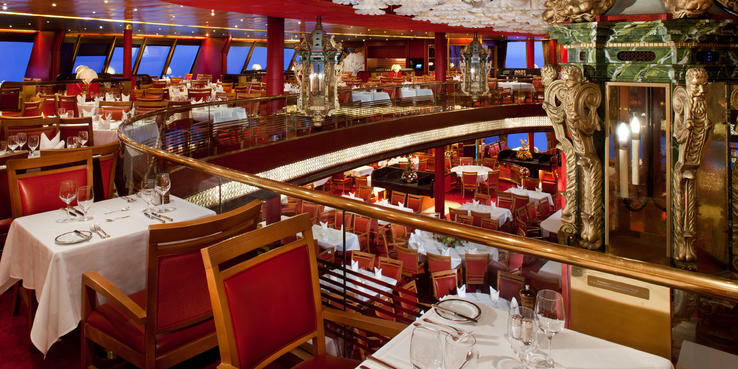 One level of the ship's two-deck-high dining room is dedicated to traditional "early or main seating" (Deck 8 on my cruise), while the other is reserved for anytime dining (the larger Deck 7). Passengers opting for the flexible option can make reservations ahead of time -- or simply walk in. The Rotterdam Dining Room is striking. Instead of the usual neutral colors, the decor is rich red and gold, with three-dimensional flowers hanging from the ceiling and ornate lanterns on the railings. The dining room has two levels, and there is enough room between tables for private conversation and easy movement. Service in the main dining room is universally good and warmly attentive; the wine steward is knowledgeable and pleasant with both novices and experts. Dinner menus offer appetizers, soups and salads, entrees, two salmon options each night on Alaska cruises (which were consistently excellent, even toward the end of the cruise) and a few other options, which are offered every night (French onion soup, Caesar salad, grilled chicken breast and New York strip steak). One item per course is marked as the healthier Greenhouse Spa option, and one appetizer, soup, salad and entree is always vegetarian. I never had a bad dish on my three nights dining in the Rotterdam, and food seemed improved from when I sailed with Holland America in 2007. The Rotterdam also offers a 22-dish, vegetarian-only menu for lunch and dinner; it consists of appetizers, salads, soups and entrees. Options include dishes like portobello mushroom and chipotle quesadillas, Vietnamese vegetable spring rolls or spicy lentil and garbanzo salad. Editor's Note: Here's a caveat about the flexible dining plan. If you don't make a reservation for your preferred dinner time and table size each night, you take your chances in the dining room. One night I walked in at 6:30 p.m., and only four tables were open, all of which were large (though only two other diners were placed with us). On our trip, a week-long Alaska cruise, 7:30 p.m. and 8 p.m. tended to be the busiest times; some passengers who arrived then told us they waited more than an hour for a table. Breakfast and lunch are also served in the dining room (though Rotterdam is sometimes closed for lunch -- on those days, the Pinnacle Grill serves a sit-down lunch), as is afternoon tea on sea days. Breakfast specialties include kippered herring, omelets, Belgian waffles and Eggs Benedict. The lunch menu offers a selection of three appetizers; a hot soup, a chilled soup or a salad; and several entrees. (There's no dedicated vegetarian lunch entree, though there's often a pasta dish.) A Royal Dutch Tea and an Indonesian Coffee Service were served on two of the sea days from 3 p.m. to 4 p.m. The Lido Restaurant serves breakfast from 6 a.m to 11 a.m., lunch from 11:30 a.m. to 2 p.m., snacks from 2 p.m. to 5 p.m., dinner from 5:30 p.m. to 8 p.m. and a late-night snack from 11 p.m. to midnight. Although the restaurant is set up buffet-style, most of the hot food is not self-service. On my cruise, the serving lines never seemed to be fully staffed, which often led to waits. Breakfast has the typical cereals, fruit, breakfast pastries, eggs (including a made-to-order omelet station), oatmeal, pancakes/French toast and breakfast meats. Tea, coffee and a selection of juices are available. Lunch is set up in multiple stations (salad and soup, cheese, hot entrees, carving dish, Italian, Asian, sandwich bar, dessert). Don't miss the fabulous chocolate-chip cookies. Dinner in the Lido typically features many of the same dishes as are being served in the Rotterdam but with some omissions and additions. Late-night snacks are themed -- All American, Indonesian, Dutch, Italian, etc. The most touted is the Dessert Extravaganza, where bread is made to look like animals, watermelons are carved with faces, and edible mice sit atop a cheesecake. Post dry dock, one section of the Lido has been outfitted with a slightly different decor, and at dinner (served from 5:30 p.m. to 9:30 p.m.), this area becomes Canaletto, an alternative Italian dining experience. Reservations are suggested, but walk-ups are accepted on a space-available basis. There is a $15 fee to dine there, and the menu is the same each night. The area can seat 60 people at one time and serves about 90 diners in the course of an evening. The menu starts with antipasti -- choose from grilled veggies, balls of mozzarella cheese and Italian deli meats. Next is a choice of appetizers (salad, minestrone soup or seafood soup), and entrees include assorted pasta dishes, Veal Milanese, Chicken Marsala Scaloppini and Cod Putanesca. At the end of the meal, every table receives a dish of cotton candy to share, in addition to a choice of desserts. The food and experience is quite good, and I definitely felt like I was far away from the hustle and bustle of the Lido's buffet section. The waitstaff, all Asian, good-naturedly wear gondolier-inspired outfits and wish you "buona sera" (good evening in Italian). More oddly, they're given Italian nicknames. One waiter even made origami butterflies out of old menus for the ladies. It was a fun dinner -- partly because the waiters made a point to interact with the diners and partly because it was a low-key atmosphere without the pressure of fine dining for an extra fee. The Terrace Grill is open from 11:30 a.m. to 6 p.m. and serves up hamburgers, veggie burgers, grilled chicken, hot dogs and sausage. The poolside area just opposite the Grill is also used for stations offering Mexican and Indonesian food and sometimes pasta. Also open from 11:30 a.m. to 6 p.m. is the new Slice pizza counter in the Retreat (though its hours may be extended in warmer cruising regions). When the lines are long in the Lido and I just wanted a quick lunch, the pizzeria was a godsend. The pizza is tasty too! Hands down, the best food on Veendam can be found at the Pinnacle Grill, Holland America's alternative dining venue with a steakhouse and Pacific Northwest seafood theme. It has a $35 per person surcharge, and dinners routinely take 2.5 hours. It also serves lunch on most days of the cruise for a $10 per person surcharge. The decor is subtle with lots of brown wood and brown chairs, but the real showstopper is the food. Waiters make a show of presenting cuts of uncooked meat in a wheeled showcase. Appetizers include lobster bisque, Dungeness crab cakes and beefsteak tomato salad. Entrees are split between meats (multiple types of steak, as well as lamb, veal and chicken) and fish (salmon, lobster, cod), with a few crossovers (a surf-n-turf featuring filet mignon and jumbo prawns or lobster macaroni and cheese). Each diner gets a choice of traditional steakhouse sides like creamed spinach and potatoes. All of the food is fabulous -- no complaints at my table of eight -- but the dish that got the best reviews was the lobster macaroni and cheese (and it is flagged as the chef's favorite). And, although the waiters talk up the chocolate and vanilla velvet souffle, the chocolate volcano cake is worth trying, too. Finally, room service is available 'round the clock. Breakfast options include juices, fruit, yogurt, breads, cereals, eggs and meats. (You can get simple omelets but not pancakes or oatmeal.) The regular menu features sandwiches (tuna melt, club), salads, milk and cookies and everyone's late-night favorite -- the cheeseburger. I was not impressed by room service delivery. The first day, our breakfast arrived without any beverages; the second, it came 15 minutes before our selected time. (I was still in bed.) Ironically, our dinner order was the only one without a hitch, though I did think it odd that they gave two people a plate of three cookies.